All unique designs, logo, and photographic images described or displayed on the website are the intellectual property of Ladybug Florist Inc. No use of these items may be made without prior written consent. By using this site, you assume full responsibility in connection with your use of this site. 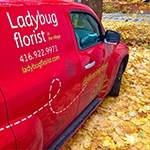 Ladybug Florist shall not be liable for any damages of any kind related to your use of this site. Flowers are subject to seasonal availability and weather-related quality issues. We reserve the right to make minor substitutions to the flower content of the arrangements featured in our catalog. The substitutions will maintain the look, feel and value of the item as pictured. If the floral container shown online is not available, a similar container will be used. We will notify you if any major substitution needs to be made. 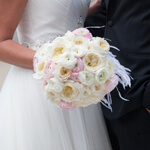 Ladybug Florist Inc. reserves the right to change our policy at any time. Future policy changes will be posted on our website. What information is collected by Ladybug Florist Inc? Only information that you provide on our shopping site will be collected. We implement a variety of security measures to maintain the privacy of your personal information. Your information will not be sold, rented or leased to a third-party. We may however use your email address to send our newsletter, or occasional information on in-store sales. You can remove your name from the list at any time by contacting us. If there is a problem with an item ordered on the website – we will happily replace it. However, as flowers are a perishable item – we can not offer a replacement after 48 hours. One replacement only per order. We do not offer refunds.